Exuberant and crafted with vigor. 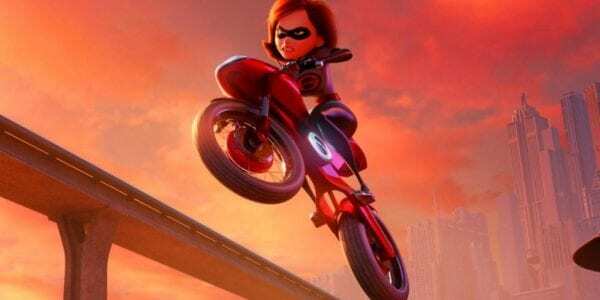 Putting many of its live-action counterparts to shame, Incredibles 2 is one of the best superhero movies of the year and it certainly doesn’t skimp on the action. Rather, it boasts a healthy assortment of captivating set-pieces, any of which could justifiably feature on this list. Pixar’s trademark imagination is certainly in full force, as they pull out all the stops to present us with things we truly haven’t seen before. Which is quite the accomplishment, considering that almost all of the characters have relatively conventional abilities- e.g. super strength, hyper-speed, invisibility and ice manipulation. This is largely because of all the novel ways that these (otherwise bog-standard) powers are used, as it’s evident that a lot of time was dedicated to thinking outside the box. Nowhere is this quality better exemplified than in the film’s nail-biting monorail sequence, wherein Helen (AKA Elastigirl) is tasked with pursuing an out-of-control train and then finding a way to bring it to a halt. In order to keep up with the unruly locomotive, she takes to the streets on her obscenely cool Elasticycle: which is essentially a motorbike that can split itself into two halves that Helen then operates independently, via her stretch powers. It’s a really fun gadget in its own right, but what’s so outstanding is that the creativity doesn’t stop there. In fact, the filmmakers really exploit the gimmick, cramming this sequence full of bonkers ideas. One particularly ingenious manoeuvre sees Helen detach the bike into its two unicycle components, and then extend herself sideways so that she can drive along both sides of a tunnel simultaneously. If you’re having trouble picturing what that looks like, just imagine how hard it must have been to storyboard! The whole chase is overflowing with jaw-dropping moments like this (Helen propels herself around the rooftops, using the Elasticycle like Spider-Man uses his webs) and it’s all gorgeously animated to boot. However, it’s not just invigorating from a visual perspective. It’s also oddly refreshing in terms of what it’s depicting: a superhero going out of their way to rescue people, as opposed to just fighting. Because that’s what they used to do. They used to catch people as they fell out the sky and pulled them out of burning buildings. But somewhere along the way that earnestness was side-lined, in order to make room for extravagant battles and gargantuan alien invasions. Don’t get me wrong, I like that stuff too. But it’s nice to see some good old-fashioned heroism again! The fact that it looks this awesome is just the cherry on top! You are not prepared for the squirm-inducing brutality. Chances are you haven’t heard of this criminally overlooked film and were you to happen across it on Netflix, then you’d probably give it a miss. After all it has been regrettably tarnished by the streaming giant’s ‘’Originals’’ brand, which has increasingly become a bad omen, thanks to unsightly blemishes like The Cloverfield Paradox, Open House, Extinction and Tau. If you did avoid the movie due to this unappetising label, then that would be nothing short of a minor tragedy, as you’d be missing out one of the best action releases of the past decade. Confidently holding its own against the likes of Kingsman, John Wick and, yes, even The Raid, The Night Comes for Us is all killer, no filler. What’s more, it has an unrelenting intensity that makes even Fury Road look positively sedate. From minute one, it is laser-focussed on showcasing exceptional martial arts, dizzying athleticism and unflinching gore. Speaking of which, it’s worth pointing out that the level of violence here is so extreme and graphic, it would make Pascal Laugier wince. Which might be a turn off for some people, guaranteeing that the film won’t be everyone’s cup of tea. But for those of us who admire proper, well-executed action, then it’s a certified must-see and a refreshing palate cleanser after all of 2018’s CGI heavy blockbusters. You might have noticed that, instead of handpicking a specific fight sequence from the movie, I’ve just been gushing about it in more general terms. And that’s because any given fight from The Night Comes From Us would be an automatic shoe-in for the top-spot on this list. They’re all that good, exemplary in their choreography, editing, stunt work, and practical effects. Nevertheless, if I had to choose one scene to best represent the white-knuckle experience, then it would have to be the grueling final showdown, which is somehow both transfixing and difficult-to-watch at the same time. For you cannot bring yourself to turn away from the screen, out of fear you’ll miss some the mind-blowing and lightening quick martial arts. Yet on the other hand, it’s also one of the most exhausting and agonising fights you’ll ever witness, with tendons being slashed, organs punctured, bones broken, and faces disfigured beyond recognition. Hollywood releases have no excuse for uninspired and boring spectacle, when a smaller movie like this can exhibit such high calibre action. Every frame of the fight is utterly mesmerising, and I genuinely didn’t realise that human beings were capable of some of the things these guys do. With that being said, do yourself a favour, load up Netflix right now and give The Night Comes for Us a whirl. It deserves your attention.